Your first choice for body shops in Central Texas. Auto Crane Rebuilding, Custom Weld & Fabrication With Certified Welder, Paint, Graphics, & More! Located in Buda, just south of Austin, we specialize in collision and auto body paint & auto repair in the Austin area for fleet vehicles, cars & trucks, motor homes, RVs, buses, and trailers for Austin, Buda, Kyle, San Antonio, San Marcos, Wimberley, New Braunfels and south central Texas. We also offer lift gate sales and repairs and vehicle graphics! Since 1998, we have been serving communities in Hays, Travis, Williamson, Comal and Bexar counties. We are a Certified First Network provider specializing in paint and medium to heavy-duty body repair and graphics for autos, trucks, RVs, motorhomes and trailers. While we specialize in commercial fleet body repair and painting such as our work on McNeilus or Supreme trucks, our automotive body shop can handle paint or auto repair for any size truck or auto, including medium duty box trucks, buses, cargo vans, RVs and fifth-wheel trailers. Our 64’ spray booth is large enough to accommodate any need you may have, such as painting large commercial tractors or trailers, as well as commercial equipment including cargo trailers and forklifts. We can even repair damage caused by hail. 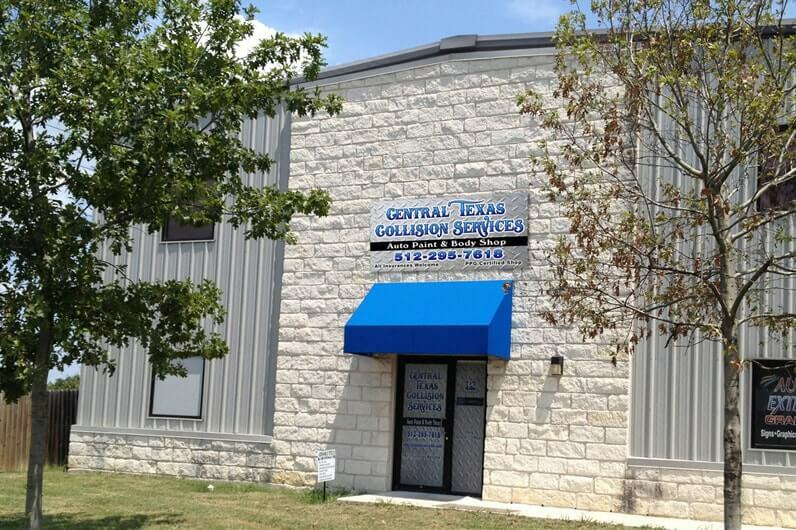 As a customer of Central Texas Collision Services, you can be assured that your needs come first. From your first encounter with our receptionist, to your last encounter as you leave with your professionally repaired vehicle, our body shop will exceed your expectations – that’s our promise. We know that being off the road and having your box truck (Peterbilt, Mack, Freightliner, or Morgan) sitting in our body shop means money coming out of your pocket. And if it’s your personal auto that’s with us for paint and collision repair – well, we understand the inconvenience of being without your car or SUV, therefore, we pledge that we’ll get you back on the road – FAST. Our auto body repairs are timely, accurate and of top quality! CTCS employees are skilled technicians and PPG Certified. We offer mobile estimating on any of your commercial paint, body repair, and auto repair needs by appointment. We’re happy to work with any insurance company and will smoothly handle the claims process for you. For more information, visit our FAQs page, or contact us. We are the only factory-authorized repair facility in Austin and surrounding areas for Smyrna truck and we are proud to carry the Good Housekeeping Seal of approval. Our experienced staff can work on any vehicle you drive-both foreign and domestic. And don’t worry if your graphic got crushed in a collision, we can replace it for you on-site. Please visit our sister company, Austin Extreme Graphics to find out more about our fleet graphic services. Call, email, or come by today!